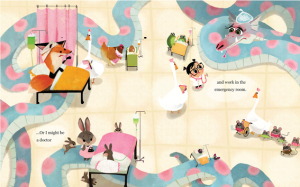 Keika Yamaguchi is a children’s book illustrator of Sick of Being Sick written by Justin Sullivan, and Puddle Pug written by Kim Norman. 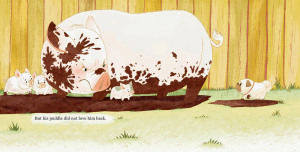 Her newly illustrated book that came out this June is What About Moose? written by Corey Rosen Schwartz and Rebecca Gomez. She is a graduated from Pasadena Art Center College of Design with honors. 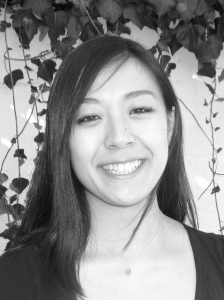 She studied Entertainment Arts, and work for clients including Walt Disney Imagineering and Walt Disney Publishing. A friend of a friend, Justin Sullivan, was looking for an illustrator for the story he wrote. He owned a children’s app company, and at the time, there were only few companies that specialized in phone apps for children. I enjoyed the story that he came up with since it allowed me to illustrate variety of environments. While working on that book, I rediscovered my passion for children’s books. After self publishing that book, I was going to bookstores to see if people will be interested in having my book in their stores. I was then referred to checkout Society of Children’s Books for Writers and Illustrators. I went to one of the events and there, I was immersed into this industry. It’s hard for me to identify what exactly makes my work mine and how it appears different from other people’s artwork. I enjoy placing my focus on characters, the layout of the pages, and the amount of details I place in each page. Perhaps that makes my illustration distinct. When I was in highschool I have done multiple art competitions and won few awards. That games be confidence that maybe I can get somewhere with this talent. A teacher outside of my school made living out of doing art, so convinced me that it’s probably possible to make a living pursuing art. Yes, technology has changed the way I work. It has added few short cuts for me compared to illustrating traditionally that been coming in handy when under tight deadline. Sending my artwork to clients became much easier when painting or drawing using photoshop. I do not have to scan my work and alter the colors in the scanned image to match what I have in my traditional artwork. I don’t have to go to the post office, wrap my work, then send my originals to my client in NY. At the moment, my biggest influences are my peers at my coworking place–Kleverdog. People there are either self employed, small business owners, trying their best to maintain their business. They’re full of passion and we share openly of what’s working for us what isn’t. Every time I talk to someone I feel inspired to work harder and keep going. Usually, before getting hired to be the illustrator, the publishing company that I would be working for would ask to draw or paint the main character in the book. The feel of the book is usually determined at that stage. If there are details that they would like for me to depict in the book, there are usually artist notes included when they provide me with the final manuscript so I make sure I put in what they asked. 7) Tell us about the proudest piece of work you have done. Did you enjoy working on Puddle Pug and its subsequent book by the same publisher? Each illustrations within those books had it’s own challenges that I had to solve. Knowing that I’ve done my best with all of them, I’m proud of all the pieces I‘ve illustrated. I enjoyed working on all of the books I’ve illustrated too! Should you wish to know more about Keika, here are her pertinent details.